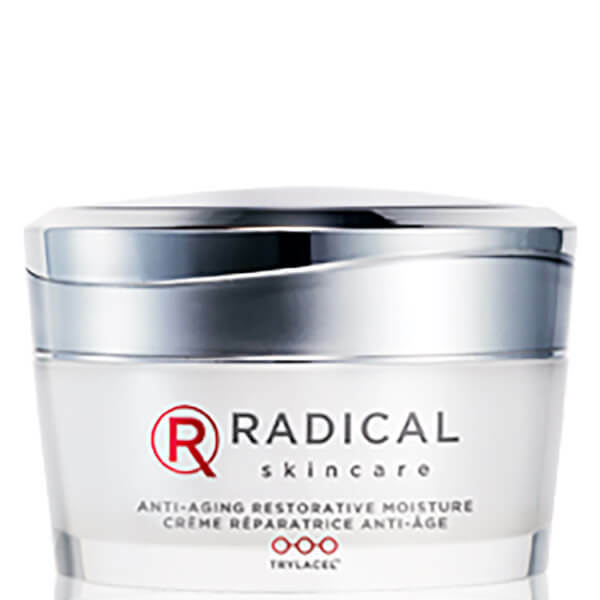 Treat your skin to the nourishing, antioxidant properties of Radical Skincare Anti-Aging Restorative Moisture Crème, a lightweight, deeply hydrating face cream that is unbleached to retain its natural colour. Perfect for sensitive skin, the revitalising moisturiser is enriched with a cocktail of high performance active ingredients, including Jojoba, Vitamin E and Aloe for their super hydrating benefits, and utilises Tryacel™ Technology, which combines an antioxidant complex with repair actives and skin calming to deeply nourish and care for skin. Absorbing quickly without oily residue, the daily moisturiser targets discolouration to brighten and even the appearance of the complexion, and performs a soothing and anti-ageing effect to reduce the look of redness while improving firmness and elasticity. Over time, fine lines and wrinkles appear reduced; skin feels nourished and recharged. Apply to cleansed skin morning and night. Aqua (Water), Aloe Barbadensis Leaf Juice, Simmondsia Chinensis (Jojoba) Seed Oil, Butylene Glycol, Vitis Vinifera (Grape) Seed Extract, Glyceryl Stearate, Glycerin, Polyglyceryl-10 Pentastearate, Behenyl Alcohol, Caprylic / Capric Triglyceride, Dimethicone, Hydroxyethyl Acrylate / Sodium Acryloyldimethyl Taurate Copolymer, Sodium Hyaluronate Crosspolymer, Coffea Arabica (Coffee) Seed Extract, Euterpe Oleracea Fruit Extract, Euterpe Oleracea Fruit Oil, Bellis Perennis (Daisy) Flower Extract, Panthenol, Sodium Ascorbyl Phosphate, Disodium Adenosine Triphosphate, Niacinamide, Malachite Extract, Palmitoyl Tripeptide-5, Camellia Sinensis (Jojoba) Leaf Extract, Vitis Vinifera (Grape) Vine Extract, Allantoin, Phenoxyethanol, Squalane, Propylene Glycol, Hexylresorcinol, Sodium Stearoyl Lactylate, Acrylates / C10-30 Alkyl Acrylate Crosspolymer, Hydrolyzed Oat Protein, Tocopheryl Acetate, Polysorbate 60, Citrus Reticulata (Tangerine) Peel Oil, Citrus Aurantium Dulcis (Orange) Oil, Ethylhexylglycerin, Pentylene Glycol, Disodium EDTA, Potassium Sorbate, Sorbitan Isostearate, Sodium Benzoate, Lecithin, Xanthan Gum, BHT, Limonene, Linalool.